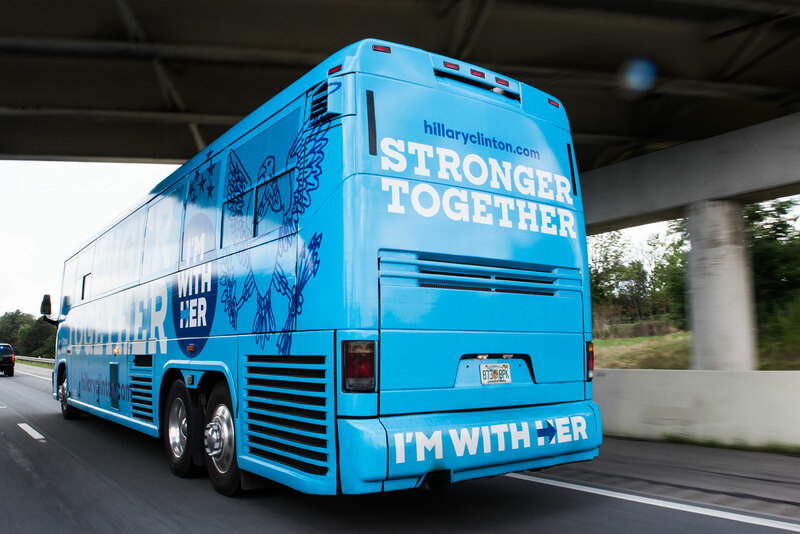 In 2014 we were approached by Michael Bierut and his team to Pentagram to use our typeface, Sharp Sans Display No.1, for their newest identity project: the Hillary 2016 presidential campaign. After some discussion, we would come to develop and donate a multifaceted superfamily that would function for the campaign’s every need. When we first learned that the Hillary Clinton 2016 presidential campaign was interested in using Sharp Sans Display No.1, we hoped that this would be the opportunity to finally complete Sharp Sans, a project we had been thinking about for some time. The original had achieved a noteworthy level of prominence, but seeing it out in the world for a few years led us to regard the design as improvable. We had drawn a tightly spaced, Lubalinesque geometric sans that looked really good big. Now we wanted to draw a version with utility and versatility, that could work in any situation. As a display typeface, Sharp Sans Display’s limitations cannot be separated from its strengths. It’s highly geometric and tightly packed forms give it striking visual appeal but also limit its utility as an all-purpose font. It functions best when set sufficiently big, and although you could manually track it out for smaller type settings, it was designed to be hyper-tight. Optical sizing is not something that every user of type understands, nor should we assume that they do, as a sans-serif typeface is often considered by many to work for every size or context. This is exactly what we considered when digesting the implications of using Sharp Sans Display No.1 Extrabold as the main typeface for a major presidential campaign. It’s safe to assume that Michael Bierut & his team at Pentagram understand how to use Sharp Sans Display in order to achieve a perfect type setting, but we can’t make that assumption with the average professional or volunteer in the Hillary campaign designing email templates or distribution leaflets is going know that the font needs to be tracked out at smaller text settings, or remember they have to replace it with a text font at anything below 18pt. It occurred to us that a serious presidential campaign needed a typeface that could work in any situation. The first and most obvious step was raising the x-height and opening up the metrics (tracking it out). Thorough adjustment to the lowercase forms ensued. We opened up apertures, experimented with new constructions, and made subtle adjustments to weight and emphasis. Some things we loved about the display style ended up finding new ways to rhyme and groove with the new lowercase. The lowercase a was given a new double story construction in this new version due to legibility issues with the classic Futura a at small sizes. The newer a is the default form in the recently available retail version of Sharp Sans, but regarding the official Hillary Clinton edition, titled Sharp Unity, both Bierut and Jennifer Kinon, the co-founder of OCD who later took over as design director of the campaign, insisted on the importance of the original Futura style a. Although we had reservations at first, we came to really like the Futura a for their campaign branding. Its Futura underpinnings were in style, and it conjured a friendly and chic quality that spoke well to her brand. Kinon and her team took the identity to the next level with the consistently flawless execution of campaign materials. 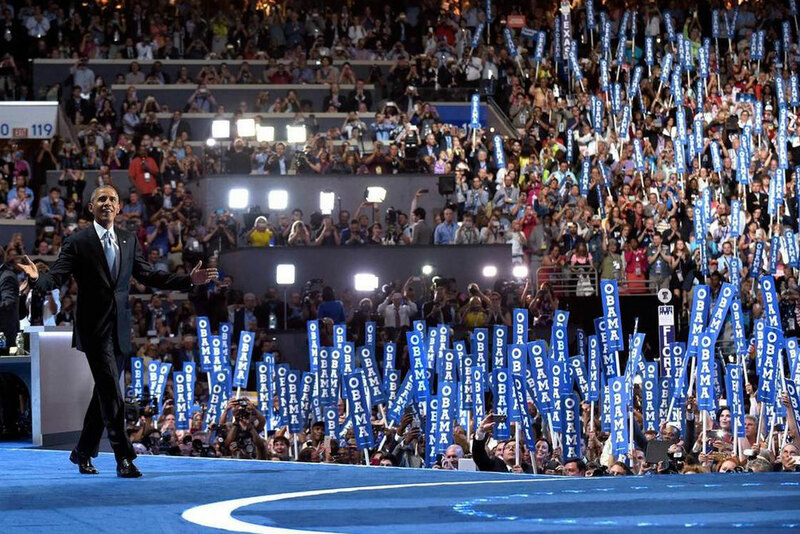 The Democratic National Convention was a particularly momentous occasion and an amazing example of their tireless efforts. In our work, we seek perfect optimal letter width relationships in uppercase settings. The word-shape of the new Sharp Sans uppercase has a much evener interval of rhythm than its display counterpart. Our methodology behind this was to find the sweet spot in between the two extremes of monospacing and a hypothetical extreme of proportional/varied letter widths. The features unique to monolinear capital letters that make the scrutiny of this system of letter width so important, we are convinced, is the lack of ascenders and descenders, and the monolinearity of its forms. The above diagram is meant to show each letters relationship in width to the uppercase H. The degree to which each letterform inhabits or exceeds this space is unique to the construction of that particular letter. We did not want to make them all optically appear the same width, and find that our eye tends to enjoy an exaggerated overshoot of the bowls, and a reduction of width in forms that take up less optical weight than those of the flat stems. This reduction is evident in the forms like the E, F, I, L, and Z. Other letters like the A and V compensate by taking up more ground with less form. In letters made up of higher amounts of separate strokes like the “M” and “W”, the density of form gets too dark and they must exceed the confines of the H-width substantially. The I and J are outliers of the median weight range on the opposite extreme, as they comprise of only a single stroke and therefore take up far less space. The italic lowercase was completely redrawn as well. We consider the lowercase of Sharp Sans Display’s italics as our “window pieces” as they make for visually appealing type specimens, but are too distinct to ever be as versatile as their roman counterparts. As a result, we opted for a more standard and versatile italic design for the new Sharp Sans. We’ve also implemented other useful updates to the new Sharp Sans. The quotations, apostrophe, ampersand, and the numerals were all drawn from scratch and give the typeface a friendly and approachable voice. Although Hillary lost in November, we are truly grateful to have worked with such an incredible team.